Incoming DLC is the first Workshop add-on to introduce quests. Fallout 4’s Vault-Tec Workshop expansion is almost upon us, which means we’ll soon become clandestine lair-building overseers. Come July 26, this Tuesday, we’ll get the chance to “build a brighter future underground”, craft “massive vaults”, and “run Vault-Tec approved experiments” on whoever dares let us. We’ll also get treated to a new quest, Bethesda has now revealed, making it the forthcoming DLC the first Workshop add-on to do so. Assuming you’re above level 20, a distress beacon, which can be heard anywhere in the Commonwealth, will sound—alerting you to attend an emergency at Vault 88. Once there, you’ll lay waste to a group of unpleasant raiders and will then happen upon the vault’s charming yet distinctly odd ghoul-transformed overseer. She’s into weird experiments, you learn, and that’s where your quest kicks off. “You’ll start off by interviewing some potential new settlers, searching for the perfect subject for all your nefarious tests,” explains a blog post on the Bethesda site. “From there you will be tasked with running a series of experiments, each with different outcomes, depending on the choices you make. Will you be a benevolent leader? Or a cruel tyrant? Or maybe somewhere in the middle? If that all sounds a bit too gross for your liking, you don’t actually need to complete the quest, says Bethesda—the “pure Workshop experience” can be had by offing the vault keeper or by dismissing her upon arrival. “If you do choose to kill her or force her out, you’ll still be able to build a basic version of each experiment item,” adds the blog post. The Vault-Tec Workshop expansion also brings with it a host of nifty tools and items, such as clean furniture, new Vault-themed decorations including a Vault Boy and Vault Girl statue, the experiment-related items you create during the quest part of the add-on, and the newly added Barber and Surgeon chairs—the latter of which means you can now change your look without making the trek to Diamond City. 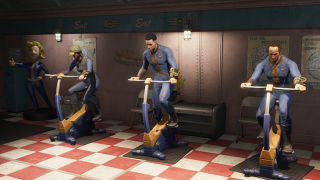 Fallout 4's Vault-Tec Workshop DLC is due July 26.